Punxsutawney Phil is a prognosticator, sometimes agonistic and quite possibly agnostic.That's a lot of "ics" for one little rodent. but groundhogs are taught from a very early age to develop their ics. Phil is an expert at predicting, fighting and possibly doubting. He actually does not have many deliberate thought processes. He operates mostly on instinct. Although the media has tried to suppress the pugilistic side of his personality, it's still a part of who he is. Phil should be an expert icker after being alive for over 126 years. According to Phil's co-handler, Ron Ploucha, Phil imbibes his annual magical dose of "The Elixir of Life" in early September. This enables Phil to add another 7 years of life for each sip of the Elixir. I say "Bottoms Up"! This Elixir apparently only works on groundhogs that are at least 50 years old. You can obtain the recipe for this potion online, but let me caution you that it involves Giant Sequoia trees of California, Gingko trees of who knows where, ice from Antarctica, apples, carrots, celery, alfalfa sprouts, acorns, dandelion roots, garlic and strawberry Kool-Aid. The rarest ingredient is pasteurized, homogenized, distilled Lochness Monster urine.(Ick!) Add salt and pepper to taste. Voila! Serves 1 groundhog named Punxsutawney Phil. Bill Deeley, inner circle president and distant relative of Sandra Seeley, humor writer and Dallas Seavey, 2012 Iditarod winner, told Kanela that his favorite drink is a diet Coke. And I quote, " It's much easier to obtain than the Elixir, but just as magical. After all, it's the real thing!" Just observe how youthful Bill Deeley looks, and he's actually 135 years old. You may be wondering what Phil does in his 364 days of spare time. Well, he is an accomplished swimmer, an excellent tree climber and a prolific hibernator. He also tries to avoid the Fuller Brush Man who has been stalking him door to door since 1906. Apparently, when frightened, the hairs of Phil's tail stand straight up, creating the perfect hair brush. Fuller Brush PR people will tell you that Fuller Brush is known for premium quality hair brushes. They also tell you that the handles are made of elegant beechwood. What they don't tell you is that they also use natural groundhog bristles! When contacted by phone, Mr. Fuller Brush (Fuller is a funny first name!) insisted the bristles were made from boars. I say, "Where is the truth in advertising?" Well, Phil is now putting away his prognosticator hat for another year. 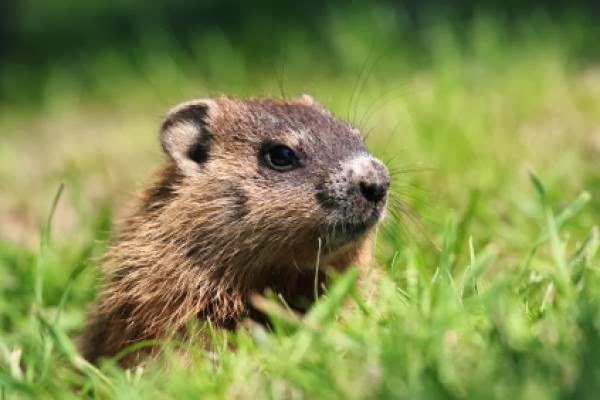 Alas, Phil saw his shadow which means six more weeks of winter. Kanela is predicting she will soon purchase a groundhog brush. Even Jose Eber uses them on the Hollywood Stars! Please email your predictions to Kanela at sandraseeley.com. Breaking News: Kanela just saw Phil's shadow! What does it mean? Comments are better late than never, right? Are the six weeks up yet, and is winter over?? ?